home restaurant is a very veg friendly joint serving american home style meals. they have two locations: los feliz on the corner of hillhurst and kingswell and the second in the silverlake area on the corner of riverside and fletcher. both locations serve the same menu but the silverlake location is much larger and imo has a cozier atmosphere. i have become a regular at home in silverlake and the breakfast burrito (substitute tofu for egg and minus cheese) has become one of my favorite meals. 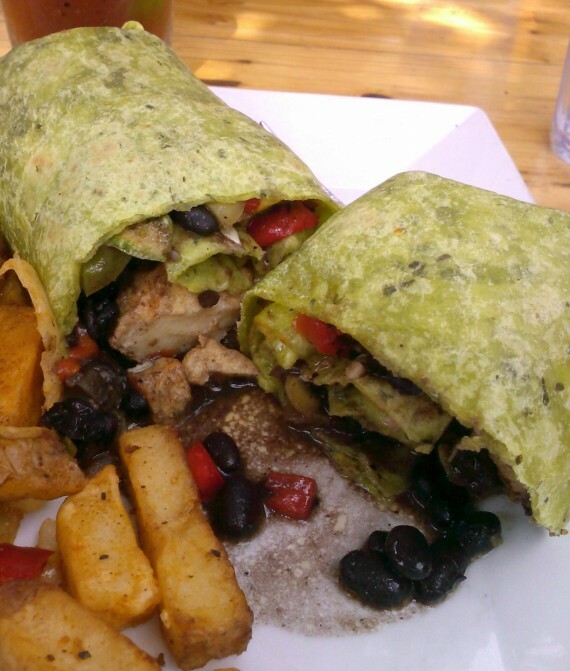 the veganized version serves up a spinach tortilla filled with tofu, grilled veggies, garlic, black beans, and salsa served on the side. it’s served with a choice of home fries or fresh fruit. when i awake in the morning my typical first thought is “breakfast burrito” and (when i have the time) the craving leads me directly to home.